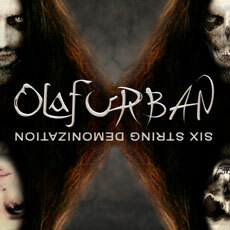 After the successful release of his debut "Six String Demonization", the second solo album of Olaf Urban is now available since spring 2011. 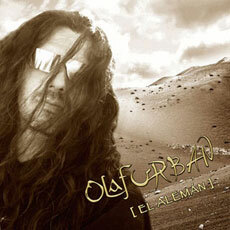 The title of the CD "El Alemán" is a tribute to his large fan base in South America. This new album consistently follows the debut with progressive, surprising and technically outstanding guitar playing. All friends of fast lead guitars and catchy melodies are well served. Of course the listeners find many new ideas and sounds on "El Alemán". Overall, this album is not quite as dark as the first release. You certainly should listen to "Walking On Desert Sands" and "Unknown Destination". These songs clearly show that Olaf Urban has a solid base in classical guitar. Rough licks are contrasted by elegant pickings and acoustic lead guitars. "Cactus Valley" and the title track "El Alemán" are real hardrock tunes with a catchy character. An interesting exception on this CD is "Gimme Some Chocolate", on one hand by the arrangement with a lot of blues and funk elements, on the other hand by the guest appearance of Joanna with her sensational soulful voice. "What The Funk Are You Talking About" proves that Peter Frampton is not the only musician who is able to use a guitar talkbox well. In conclusion, Olaf Urban has presented an impressive work with "El Alemán". The arrangements are complex and yet easy to follow … music for both brain and heart. No doubt his guitar work stands comparison with other well-known virtuosos. Demo tracks of "El Alemán" are located in the "Downloads" section of this website as well as on iTunes, Musicload, Amazon or any other important music portal. If you want to buy the CD digitally, these portals are your channels too. If you prefer to hold a "real" CD in your hands, you can order it via UJM-Records. Olaf Urban's debut album "Six String Demonization" clearly highlights the style of his guitar playing. Ultra fast tappings, catchy melodies and crazy scales ... embedded into progressive and rough music. Most of the songs on this CD are creating a dark athmosphere. They could be a perfect background for horror movies ... good examples are "Wrapped In A Shroud", "Undead" and the title track "Six String Demonization". Other tunes like "Road To Babylon" or "Juicy" surprise with funk and blues elements, but still consistently in the context of rock music. Even if the CD was actually designed as a pure studio album, it gained international success. Well-known musicians showed a lot of respect for the guitar playing on this album. Craig Goldy (guitarist with Ronnie James Dio) for example commented on Myspace: "You are quite a force to be reckoned with aren't you?". As a further result of the release of "Six String Demonization" Olaf Urban was invited by radio stations in South America and clubs in the US, as well as for participating on seminaries and studio sessions throughout Europe. Demo tracks of "Six String Demonization" are located in the "Downloads" section of this website as well as on iTunes, Musicload, Amazon or any other important music portal. If you want to buy the CD digitally, these portals are your channels too. If you prefer to hold a "real" CD in your hands, you can order it via UJM-Records.